The brief from the client was simple and clear, a clean, fresh approach with the atmosphere of an upmarket coffee shop or bar was to be taken in the conceptualization of the new showroom. The need for a showroom was the primary purpose of the space. 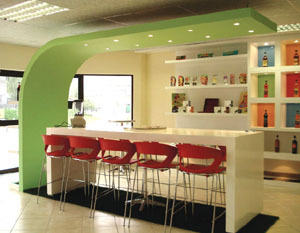 The colour scheme was inspired by the colours of the Slo-Jo products. White was used as a base colour, which promotes the purity and goodness of the product. The designer chose to highlight the table by means of a sweeping bulkhead that appears to cantilever from the floor and over the table. 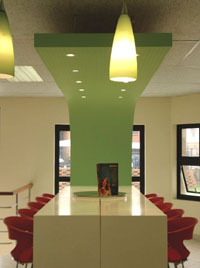 Downlighters were fitted further highlighting the table. The line of the bulkhead continues to the back of the bar by means of a secondary, smaller bulkhead and on the floor by the use of synthetic grass carpeting. This was inspired by the idea of wholesome goodness coming from the earth that the Slo-Jo product promotes. The wall display was designed to appear as a single floating entity with a trough of river pebbles below. 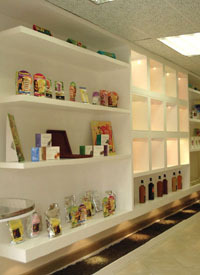 Display boxes with coloured glass back panels were used with floating shelves on either side. A long floating shelf below frames the display wall. The Slo-jo project was an extremely effective redesign of the interior and made maximum use of the available space to meet the clients objectives. Designer: Aslam Mahomed and Tania Jansen van Rensburg.